Education, Rehabilitation, Sports and Seminars are some of the key ways in which International Exchanges can come together to build a better future for young people with disabilities in North Korea by sharing ideas and expert advice between supportive networks. They also provide opportunities for these young people to participate in many international, cultural and social events that are normally inaccessible. In 2015, a small group of young, nervous people arrived in the UK with their dedicated teachers. During their stay, their audiences were astonished by their abilities. When they left, all were proud: teachers of their students, friends for each other and, most important of all, young people for what they themselves had achieved. When they returned, they were not just children who were disabled; they were gifted individuals who had showcased breathtaking talents, leading the way forward for their peers. DULA International are working to build on the relationships we developed during the 2015 Europe Tour: concerts and seminars held at University of Oxford, University of Cambridge, Royal College of Music and Institut National de Jeunes Sourds de Paris; meetings with EHRC and FCO on disability welfare; and discussions on disability sports with the British Paralympic Association and English Federation of Disability Sport. 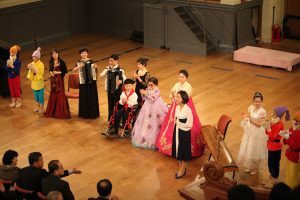 On return of the Para-Ensemble in 2017, the group once again performed at the Sheldonian theatre with the support of Oxford students and at Trinity College in Cambridge with their students, we witnessed a beautiful musical moment between two blind pianists at the Royal Welsh College of Music and Drama, and shared a grand finale at St. John’s Smith Square in London. So much was learned and experienced, and we will endeavour to continue supporting such exchange projects.